Tune into Radio Carly: Advice for attending a blog conference. I'm super excited to go to the Problogger Event next week. It's a four day weekend for me - a holiday in the sunshine state and a catch up with good friends, plus visiting the breakfast buffet more than once. But it's also worky - I'm going to drink all the bloggy advice (and the wine) and feel a sense of rejuvenation and leave filled to the brim with ideas. There are a few awesome posts offering advice for attending blog conferences - check out Kiki and Tea, Talking Frankly, Kidspot and Impactiv8. So I will just give three tips. I've been to a few conferences now, and here's what I've learnt. Your tablet or smart phone - for live tweeting and note taking, and for photo taking. A spare one if you have one. Usually you can connect to wifi there. Your charger, or portable charging devices and a power board. Because lots of tweeting and photo taking drains batteries. There are never enough powerpoints at these events - a power board means you can buddy up charging with your blog buddy. I have a cool portable charger - I bought it from a vending machine at the train station. It's by PowerPod. I cannot believe I got it from a vending machine!! The charger can be recharged by plugging it in to a USB wall charger or computer. A notepad and paper - for old-school note taking. Comfortable shoes - you will be dashing between rooms for different sessions, standing up for lunch and dancing the night away. Business cards. I get mine made by Vistaprint. I like to live tweet. I see it as a double service - making notes for yourself and sharing the conference with the outside world (or those in other sessions). Taking notes this way is a great way to save your ideas via tweets and to make blog posts from them afterward. Announce to your social media followers that you'll be live tweeting (some may be unimpressed by voracious tweeting but for many not attending, the live tweets are gold). 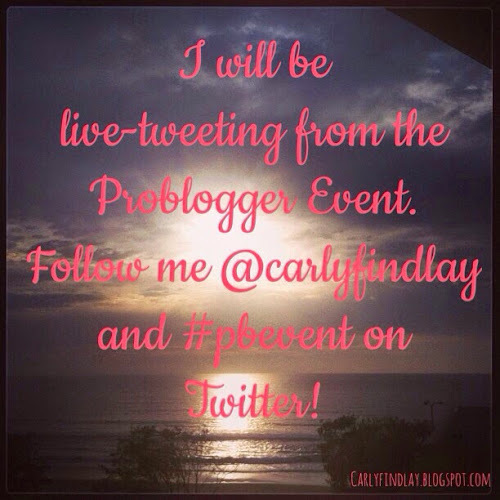 If you can't be there, follow along #pbevent - I'm on twitter @carlyfindlay. Here are my tips for live tweeting. Please say hello. Not just to me but to other bloggers you're connected with in cyberspace over time. We don't bite. I'm always so disappointed when someone says they saw me from afar but were too scared to say hello to me. Don't place anyone on a pedestal and feel intimidated to speak to them. The blogger you think is a rock star is just like you. We all started without a blog. 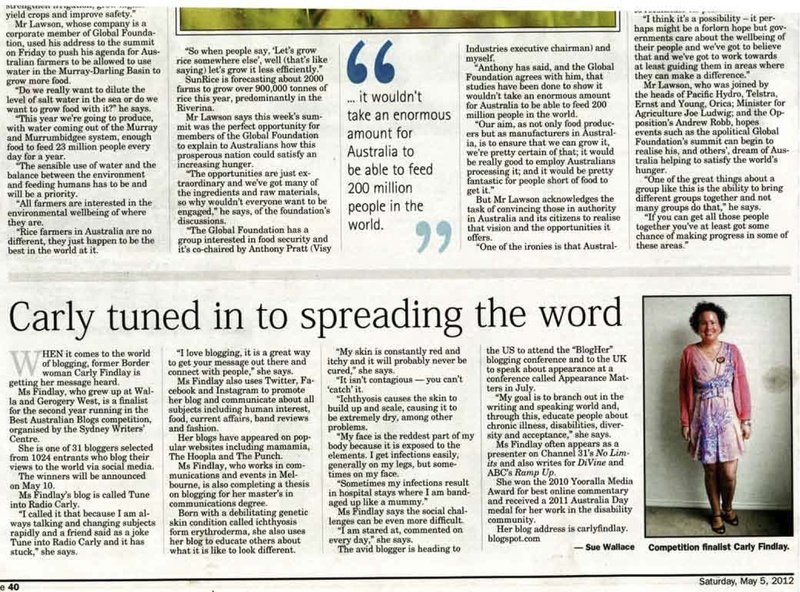 I once sat next to journalist Jacinta Tynan at a blogging session and struck up a convo with her via twitter before she turned to me with a friendly smile and a hello. 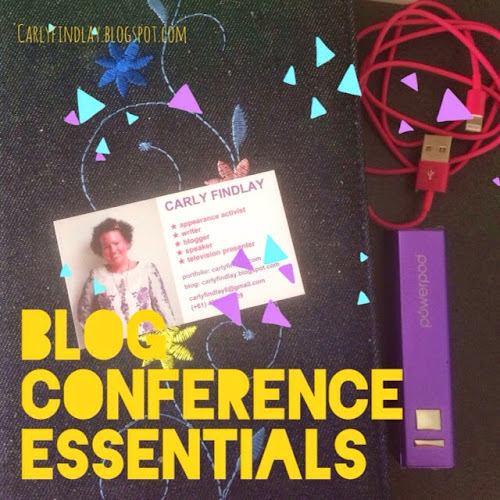 Blogging conferences can be a great change to meet up with friends, but the information overload, big crowds and hyper-catch ups can be tiring.Take some time out if things are overwhelming. I went to the pool and sat in the sunshine last year instead of going to a session. I've got another post coming up before Problogger - it's a prelude to my panel talk on blogging for social good - look out for that next week. And no doubt I will write lots of Problogger-inspired posts after the conference, like I did last year. See you on the Gold Coast, or see you online! I am loving all these Problogger posts and am pumped to come along next year - really looking forward to hearing about it all. Good luck with your panel talk! So looking forward to attending after four years if blogging. Great tips. Even though I'm a GC local I probably should try my a into g this weekend and get organised. I look foward to hearing you speak. Great post, thanks Carly! Really looking forward to the conference. And, having missed many an event and conference to date, I can tell you I have always appreciated your tweets. Great advice, Carly. Very excited about attending my first PB and I'm looking forward to meeting some bloggy friends (like yourself) face to face. Great tips! I'm thinking we need a 'nervous corner' for the pre-confernce mingling haha. Just a "come over here if you feel scared and we can be scared together" area! I found it hard to find people last year, and this year there's even more attendees! A nervous corner is great! !